Racing Tank : Go Tanks and enjoy the winner’s feeling on death race! 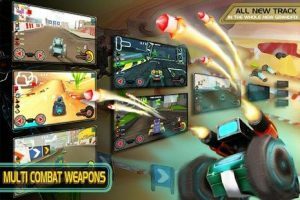 Playing role of colorful unique style tanks, your mission is to win the death race not only on grand prix roads but also on various difficult types of terrains such as deserts, docks, forests. To complete every level, tanks have to use weapons like guns, lasers, rockets, tank cuirass to combat other competing tanks.On every death race road, another task of tanks is to collect items (Drop Bomb, Horning Cartridge, Global) to increase battle indicators. More specially, tanks also have to face against harsh natural challenges like tsunami, volcano eruption and so on on each level, depending on chosen terrains. Unlike racing military tanks, this game brings you the feeling of speed and power of tanks racing on real local terrains at present. Let’s get started Fast paced 3D racing game. Good concept… Need multiplayer… Just give us wifi multiplayer for 4 player and this game bring back memory of CTR and chocobo racing from PSX. The multiplay verion already avaiable, please download Racing Tank 2 game!